Adipokines and inflammatory markers have been linked to kidney disease in animal models; however, evidence from prospective human studies is sparse. Recruited from Beijing and Shanghai in 2005, a total number of 2220 non-institutionalized Chinese individuals aged 50–70 years with baseline estimated glomerular filtration rate (eGFR) >60 mL/min/1.73 m2 were prospectively followed for 6 years. 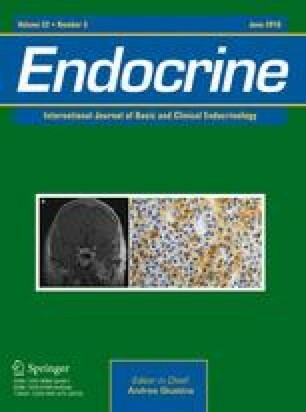 Plasma levels of resistin, retinol-binding protein 4 (RBP4), interleukin-6 (IL-6), C-reactive protein (CRP), and tumor necrosis factor-α receptor 2 (TNF-R2) were determined at baseline. Kidney function decrease was assessed by measurements of eGFR over 6 years. Incident-reduced eGFR was defined as the onset of eGFR <60 mL/min/1.73 m2, according to the Modification of Diet in Renal Disease Study Equation for Chinese. During the 6 years of follow-up, 333 (15.0 %) participants had incident-reduced eGFR. Each 1 standard deviation elevated concentration of resistin [relative risk (RR) 1.10; 95 % CI 1.00–1.24] and TNFR-2 (RR 1.30; 95 % CI 1.13–1.49) at baseline were significantly associated with a higher risk of incident-reduced eGFR. Comparing the highest with the lowest quartiles, the RR of incident-reduced eGFR was 1.43 (95 % CI 1.01–2.03) for resistin and 2.03 (95 % CI 1.41–2.93) for TNF-R2 (both P trend < 0.05) after adjustment for baseline demographic characteristics, lifestyle behaviors, BMI, plasma lipid profile, hypertension, and diabetes. These associations remained significant when further controlling for levels of RBP4, IL-6, and CRP, none of which was significantly associated with the risk of incident-reduced eGFR. In this prospective cohort study, elevated levels of resistin and TNF-R2, but not other adipokines and inflammatory markers, were independently associated with a greater risk of kidney function decline in middle-aged and elderly Chinese. The online version of this article (doi: 10.1007/s12020-015-0807-3) contains supplementary material, which is available to authorized users. This study was supported by the Ministry of Science and Technology of China (2012CB524900 and 2013BAI04B03); the National Natural Science Foundation of China (81202272, 81321062, 30930081, and 81021002); ZY3-CCCX-3-2001, ZYSNXD-CC-HPGC-JD-003; the International Postdoctoral Exchange Fellowship Program 2015; the Knowledge Innovation Program of Shanghai Institutes for Biological Sciences; Chinese Academy of Sciences [2013KIP107]; and the SA-SIBS Scholarship Program. The manuscript has neither been published previously, nor under consideration for publication elsewhere. There is no conflict of interest in this study.